Designed for high performance off-road, the Brute Force 750 4x4i EPS CAMO boasts industry leading features including speed variable Electronic Power Steering (EPS) plus a further increase in the torque and all-day working performance of its 750 cm3 V-twin engine. Add greater chassis control, plus a host of new features, and the more you experience the Brute Force 750 4x4i EPS CAMO, the better it gets. The 2017 Kawasaki Brute Force 750 4x4i Camo is powered by a fuel injected 749cc V-twin engine, the Brute Force 750 4x4i EPS and EPS Camo models both feature two- and four-wheel drive modes, which the rider can select at the touch of a button on the handlebars. They also have the benefit of Variable Front Differential Control for the limited-slip front differential, to allow the rider to choose the amount of traction to get the job done. Smooth power delivery for the rider is achieved using the Kawasaki Automatic Power-Drive System (KAPS) for the Continuously Variable Transmission (CVT) to ensure there is enough power and just the right amount of torque for the task at hand. Both models feature Electric Power Steering (EPS), making it easy to maneuver off-road and allow riders to stay in the saddle longer by reducing fatigue. Equipped with powerful front disc brakes and double wishbone independent suspension with 6.7 inches of wheel travel, as well as a sealed rear brake system, the Kawasaki Brute Force 750 4x4i EPS and EPS Camo ATVs are well suited for hard work in rough terrains. 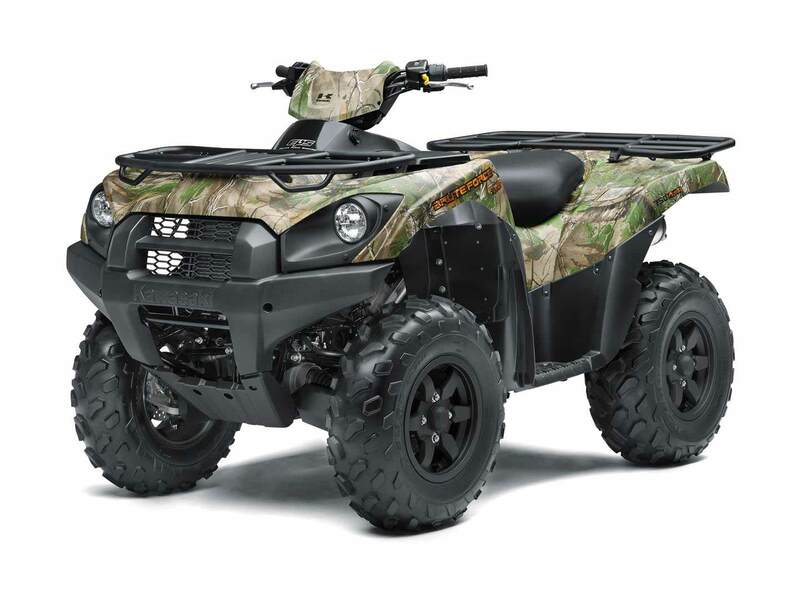 Equipped with powerful front disc brakes and double wishbone independent suspension with 6.7 inches of wheel travel, as well as a sealed rear brake system, the Kawasaki Brute Force 750 4x4i EPS and EPS Camo ATVs are well suited for hard work on difficult terrain. These Brute Force ATVs are capable of accomplishing a wide variety tasks with features like durable cargo racks with integrated tie-down loops. Attractive six-spoke cast aluminum wheels add to the Brute Force’s rugged looks. Front/rear racks, skid plate and head light covers as standard on Brute Force 750 4x4i EPS CAMO. Enhancing the high-performance brakes is the Kawasaki Engine Brake Control system, which electronically monitors ground speed and uses the engine’s compression to help slow the Brute Force 750 4x4i EPS CAMO under certain conditions. This able ATV can pull a hefty 1,250 pounds, and can carry a combined 264 pounds on its front and rear racks. Owners can expand the versatility of their Brute Force 750 4x4i EPS CAMO via an extensive line of Genuine Kawasaki Accessories, available through R W Brown - an authorised Kawasaki dealer. Kawasaki’s V-twin powered sport-utility all-terrain vehicle (ATV) family, the Brute Force 750 4x4i EPS CAMO offers refined power and handling. It combines a plush ride courtesy of its competent front and rear independent suspension with a superb four-wheel drive system and a durable yet powerful 633cc V-twin engine.